In the 17th and 18th Centuries thousands of clay pipes came to the New World and many fragments are still being found in the soil of the earliest settlements. Pipe shards and intact clays have been excavated on Civil War battlefields and in encampments in great numbers showing the strong presence of clay pipes in the 1860s among the soldiers who fought on both sides. "The Clay" remained king at least among men until the later part of the 19th Century. The first clay pipes were introduced to Europeans along with tobacco smoking by the Native Americans of South and North America. It was not long before clay pipe making became an established trade. Later mass produced European and American clay pipes became a trade item and were bartered back to Native American tribes. 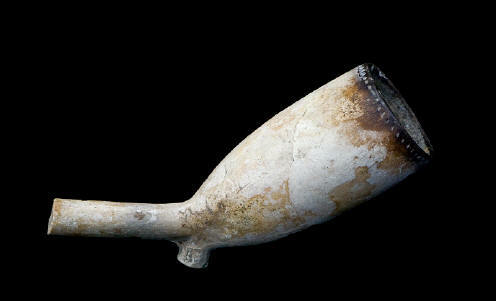 Clay pipes were popular because they were disposable and easily replaced when they broke (which happened quite a bit). A regular smoker might break several in the course of a day’s puffing, but he could buy them by the gross. Most tobacco "drinkers" preferred longer stems and since they tended to break, they could be used until they were fairly short, or had become "nose warmers" like this one. Because the stems also became bitter with continued use, smokers would purposely break off the end of the stem gradually working their way towards the bowl. When they would get so close to the the bowl that it would become a nose warmer they would throw the pipe away. This gave rise to the expression "smoking to the bitter end". This particular trade pipe fits the profile of pipes made in the late 17th century. Refinements were made so that the bowls became larger, up to 3/4 of an inch inside and not as flat on the bottom. Clay pipe makers begin to add a milled or plain ring at the top of the bowl with the maker's marks stamped somewhere on the bowl. On this pipe you can barely see the makers stamp on the heel. A shield with six stars. The heel you often see on the bottom of a clay pipe is not for resting it on a table or to hold with your fingers - it helps clay pipe makers by adding extra material (or "bottom") to the pipe when the stopper is used to make the bowl.